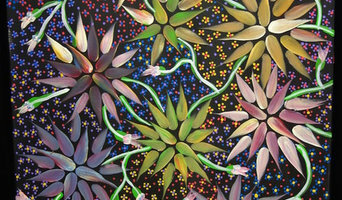 Graham Booth aka 'Buntha' is an Australian Aboriginal artist who's focus is on the desert flower. His works are acrylic on cotton canvas and cover a broad spectrum of light, colour, density and tone. Buntha specializes in commissioned pieces of art such as in home murals, ceiling murals and very large canvases. His works are predominantly displayed in the Airley Beach region of Central Queensland. Whether you’re looking for a fun and functional piece, such as ceramics or pottery, or prefer murals and decorative painting, you’ll find many Rockhampton, Queensland artists, muralists and artisans on our Professional pages, ready to include you in a creative process that will result in a stylish and personality-filled home. What types of artisans are available on Houzz? There are a wide selection of Rockhampton, Queensland artisans listed on Houzz, including muralists, painters, ceramic artists, potters, ironworkers, photographers, sculpturalists, designers of decorative glass, metal wall art, abstract art, home accessories, and more. Even everyday items such as tableware, tiles, splashbacks, lampshades and bedheads can be handcrafted, painted or designed by an artisan. You will also find artisans who specialise in bespoke designs, as well as those who offer artwork consultancy. Do you commission bespoke designs? How long will it take you to complete a bespoke design? What style do you specialise in? Do you offer advice to prolong the life of your art? Have you worked with other professionals, such as interior designers and architects, when creating or selling your art to homeowners? Find artists and craftsmen on Houzz. Peruse portfolios in the Professionals section to find abstract, traditional, and contemporary artists in Rockhampton, Queensland. Read reviews and contact artists directly to ask them more about their work.